Alle Vongole is a popular Italian dish. 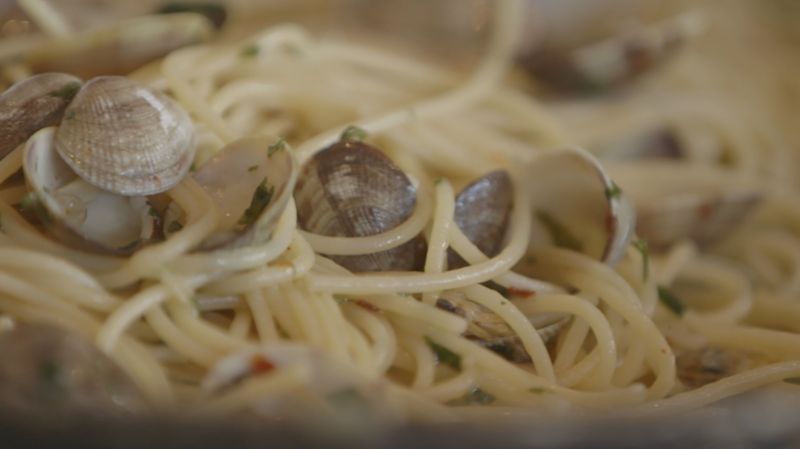 If you like clams and pasta, then this will be popular with you. This meal will leave you clamouring for more. Buon appetito! • Get a large pot of salted water onto boiling. • Slice 5 cloves garlic. Slice 1 onion. Slice 1 bunch parsley. Slice 1 fresh chili pepper. Zest ¼ lemon. • Get a large frying pan on medium high heat and add 3 tablespoons olive oil along with garlic, onions, parsley chili and lemon zest. Add pinch dried chili and cook in open pan, stirring frequently to avoid burning. • Add 1 cup white wine and allow to cook approximately 2 minutes until smell of alcohol is gone. Taste the liquid, and season with salt if needed. (Some clams will be salty enough on their own). • Remove spaghetti from water when cooked, and add directly into pan, along with ¼ cup pasta boiling water. Toss the pan to coat the pasta with the clams. Turn off the heat, and cover the pan and let it rest for 2 minutes. • Serve in communal bowl.